My roommate this week at the Straight Up Conference at James MacDonald's Harvest Bible Chapel in Rolling Meadows, IL was Jay Halle. Among other things, Jay serves as the Baseball Chapel leader for the Seattle Mariners and their minor league affiliates. Jay is a good friend but he has never visited this site. I'm trying to surprise him by putting his mug shot on Pilgrim Scribblings. By the way, Jay's last name rhymes with Holly, Molly or Golly. Remember the singer, Buddy Holly? Well Jay is my buddy Halle. On Sundays in Seattle during the baseball season, Jay Halle goes to a worship service with whoever is playing against the Seattle Mariners. Then he goes to worship with the Mariners. 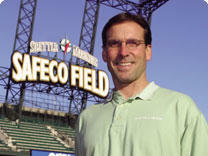 Then he has a service with the Safeco Field employees who are working that day. Most important, perhaps, then he worships with the umpires. The worship services are through the Baseball Chapel organization, which operates with full endorsement of Major League Baseball. Each of the 210 major and minor league teams has a chaplain. Every service Halle conducts is attended by 10-15 players. Do any players come in because they are in a hitting slump, and they want some supernatural help with their batting averages? Halle has a Bible study during the week with interested players. Sometimes the players call him just to check in with him and let him know how they are doing. “The best part is that in this world consumed by greed and power, you get to see a player give his life to Christ, or get more serious about his walk with Christ,” he said. Halle attends the North Seattle Church of the Nazarene, and has conducted services and counseled with major league players since 2000, after he had worked with the Mariners’ minor league affiliate in Everett, Washington. This ministry combines two of his deepest loves—sports and Christ. He played football, baseball, basketball, and several other sports throughout college, while he worked on his business degree. His fulltime job picks up on his interest in business—he is the chaplain for the employees at the Campbell Nelson Volkswagen and Nissan car dealership in Seattle. “I look back and shake my head at how God has put all of this together,” he said.